Hollywood, CA. Publisher: The Chase Printing Co.. Editor: Ruth Beymer Drown, owner and publisher; Mary Lackey, editor. 1/1, July 1941. $1.50-$2.50 a year, 48 pp. This, as it proclaimed, was "a magazine for the busy man and woman who desire an impetus in life to give them a little encouragement to carry on in a world that is fast changing from an old order into a new one. Busy minds have little time to delve deeply. Let us do it for you." This deep delving consisted of short quotations from H.P. Blavatsky and various oriental sages, Milton, and H.L. Menken (of all people), inspirational poems ("We must not desire the Perfect Way, To place ourselves on the heights; But the truth we seek, is that we may Give service to God, thru His own Divine rights"), and regular excerpts from Manley Palmer Hall's writings and lectures. The journal also carried an occasional article by George Winslow Plummer and regular contributions by the unknown "Dr. Mystery," and printed what it said was a short article on astrology "inspired by an unpublished treatise by T.H. Burgoyne, author of 'The Light of Egypt.'" 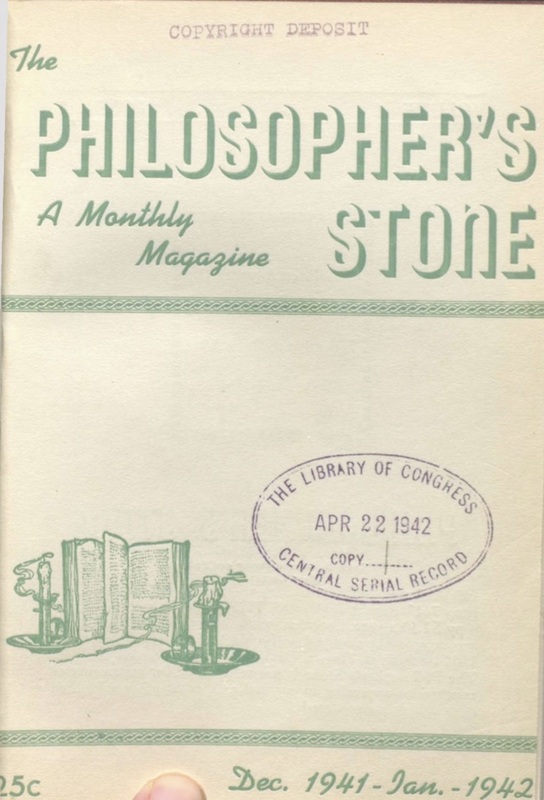 Behind this rather typical hodgepodge of aspirational California occultism of the time was the journal's underlying emphasis on the all-pervading "Energy" of the cosmos, the "Philosopher's Stone" that man could use to transform himself and the universe: "Man, created in the image and likeness of ENERGY is therefore energy in as great a force as it is allowed, or he allows it, to flow in and out of him and man himself is responsible for the condition which affects him individually." This sentiment was that of the journal's owner, Ruth B. Drown (1891-1965), a long-time student of metaphysics and the occult (particularly the Kabbalah) and provides the connection between these ideas and her more fundamental purposes: "radio therapy," "radionics," "homo-vibra," "Drown Therapy." These were nowhere mentioned in the journal -- reserved for discussion in her Journal of Drown Radiotherapy, published simultaneously -- but they were the center of her work and the reason for her subsequent indictment. From the earlier work of Albert Abrams and others in Los Angeles she had learned of the possibility of selling (or leasing in her case) marvelous electronic machines that could diagnose and heal the afflicted, and invented devices that measured the resonance ("homo-vibra") of the sick, compared it with the standards she had devised, and then adjusted the resonance of the person to the norm. When treating patients in person she hooked them up to her Homo-Vibra Ray Instrument (nine prominent rheostats and a small ammeter). The negative lead went to foot-plates on the ground (made of German silver) and the positive to a tin plate held over the solar plexus, and the knobs then twiddled to determine the patient's status. For those at a distance the same measurements could be made from a vial of blood. Drown's combination of occult ideas on cosmic energy and devices to measure and adjust it have a long history in spiritualism, Mesmerism and the occult and has its predecessors in the vast number of electro-magnetic groin belts and electric skull caps that appear in the journals throughout the second half of the nineteenth century and later, all perhaps reflecting the belief that, if orthodox science could be so wrong in judging spiritualism and the occult, it could easily be wrong about the marvels revealed by stalwart pioneers of fringe science. The editor of the journal, Mary Lackey, and her husband, Horace, also contributed to the journal. They have their own history, which John B. Buescher is in the process of discovering, but seem to have been very active in promoting the Ku Klux Klan in California in the 1920s and William Dudley Pelley's Silver Shirts a few years later, before Horace moved on the Ambassador Gold and Silver Mine in Nevada. LOC.